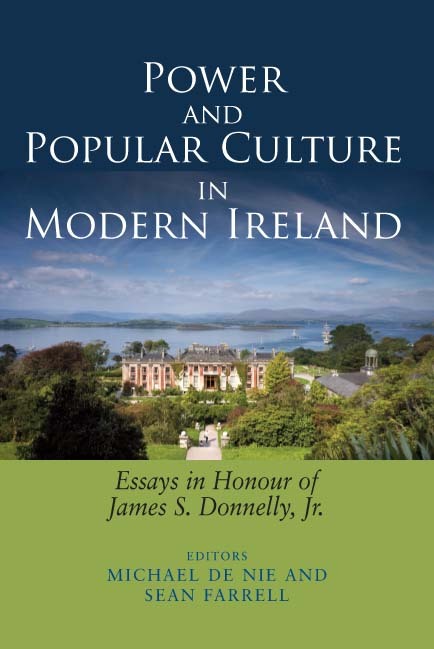 Home / 18th Century History / Power and Popular Culture in Modern Ireland: Essays in Honour of James S. Donnelly, Jr.
Power and Popular Culture in Modern Ireland: Essays in Honour of James S. Donnelly, Jr. This book celebrates the life and work of the greatest American historians of Ireland through a collection of dynamic and timely chapters on subjects such as migration, traditional music, religion and famine studies. It features the work of some of the top scholars in the field, including Kerby Miller, Cormac O’Grada, and Tim McMahon. Donnelly’s work has also made a crucial impact on Irish historiography and Irish Studies, and this book reflects that work and continues the tradition. Categories: 20th Century History, 19th Century History, 18th Century History. Featuring some of the leading scholars of Irish history, Power and Popular Culture in Modern Ireland brings together some of the best new work in Irish history to honour James Donnelly’s career and impact on Irish Studies. The volume has at its heart the issues that have permeated Donnelly’s work, namely how ordinary Irish men and women experienced and responded to expressions of state and elite power and economic change. Throughout his career Donnelly has made critical interventions in a variety of fields in Irish historical scholarship. In each case Donnelly’s contributions have played a central role in establishing the new historiographical consensus as well as serving as exemplars of meticulous and objective scholarship. This book accepts the challenge of taking this endeavour into the future, with timely and powerful contributions on such key fields of study as land reform, famine studies, migration, popular culture and religion. Michael de Nie is Associate Professor of History at the University of West Georgia. His first book, The Eternal Paddy, received the James S. Donnelly, Sr. Prize for Books on History and Social Sciences from the American Conference for Irish Studies. He has published a number of essays on the British press and Ireland. Sean Farrell is Associate Professor of History at Northern Illinois University. His first book, Rituals and Riots, received the Donald Murphy Prize for Distinguished First Book in Irish Studies from the American Conference for Irish Studies. He is currently the Vice President of the American Conference for Irish Studies. Martin Dowling is the author of Tenant Right and Agrarian Society in Ulster, 1600-1870 (Irish Academic Press, 1999). From 1998 to 2004 he was the Traditional Arts Officer in the Arts Council of Northern Ireland. He is currently Lecturer in Irish Traditional Music in the School of Music and Sonic Arts in Queen’s University of Belfast. Laurence M. Geary lectures in history at University College Cork. He has published extensively on the social, political and medical history of nineteenth-century Ireland, and on the history of the Irish in Australia. Peter Gray is professor of modern Irish history at Queen’s University Belfast. He is author of a number of works on 19th-century history, including Famine, Land and Politics. Brian Gurrin is an NUI Centennial post-doctoral research fellow, based in the Department of History at NUI Maynooth. Liam Kennedy is professor of economic & social history at Queen’s University, Belfast. His books include Irish Agriculture, co-authored with Peter Solar, and Colonialism, Religion & Nationalism. Timothy G. McMahon is associate professor of history at Marquette University in Milwaukee, WI. He is the author of Grand Opportunity and editor of Pádraig Ó Fathaigh’s War of Independence. David W. Miller, Professor of History, Carnegie Mellon University, is author of Church, State and Nation in Ireland, 1898-1921 and Queen’s Rebels. He edited Peep o’Day Boys and Defenders: Selected Documents on the Disturbances in County Armagh and co-edited Piety and Power in Ireland, 1760-1960. He has published a number of essays on modern Irish history. Kerby A. Miller is Curators’ Professor of History at the University of Missouri and author of the prize-winning Emigrants and Exiles and Irish Immigrants in the Land of Canaan, as well as Ireland and Irish America. Matthew O’Brien is an associate professor of history at the Franciscan University of Steubenville, Ohio. He co-edited After the Flood, and has published several articles in Eire-Ireland, Etudes-Irlandaises, and the U.S. Catholic Historian, as well as several book chapters and numerous book reviews. Cormac Ó Gráda is professor of economics at University College Dublin. His most recent books are Jewish Ireland in the Age of Joyce, Ireland’s Great Famine, and Famine: A Short History. Nicholas Wolf is Western Civilization Postdoctoral Fellow at George Mason University in Fairfax, Virginia. Previous articles on this subject have appeared in the New Hibernia Review and the Journal of British Studies.